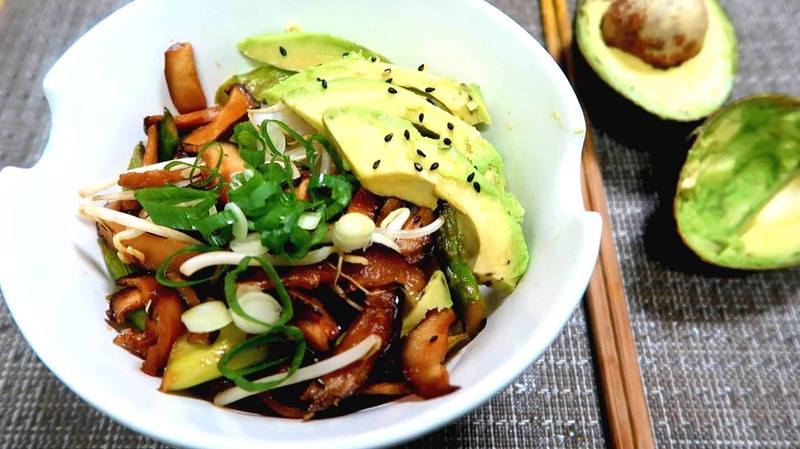 Shiitake Donburi is another simple and delicious 15 minute bowl! This veggie bowl is packed with healthy vegetables and serves as a nice post-gym or after-work meal. What does it taste like? 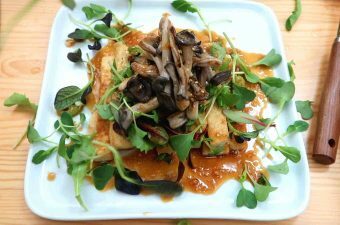 It starts with a salty and slightly sweet taste from the soy-sauce glazed Shiitake mushrooms. 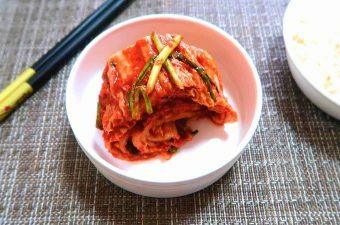 Then you will taste a light crunch from the diced asparagus and fresh mungbean sprouts, followed the creaminess of the avocados. Overall, it has a dynamic range of flavors and textures. Try it out at home and get a break from all the meat you usually eat throughout the week. 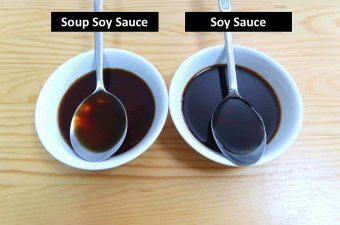 Key taste variable: Soy Sauce Glaze. This glaze uses only three ingredients. If you don’t have mirin, simply use a white wine. 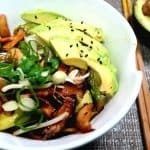 Shiitake Donburi is a delicious rice bowl that is packed with healthy vegetables and serves as a nice post-gym or after-work meal. Did I mention fresh avocado slices on the side? Place all listed glaze ingredients in a bowl and mix thoroughly. Turn off the heat and pour glaze into a bowl. Set aside to cool. Cut shiitake mushrooms into thin slices. 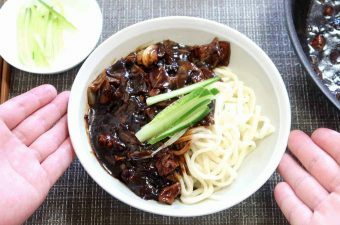 Drizzle a teaspoon of sesame oil over sliced mushrooms and mix in with your hands. Cut the ends off the asparagus. Then cut them at a slight angle. Wash mungbean sprouts and let excess water drain off. 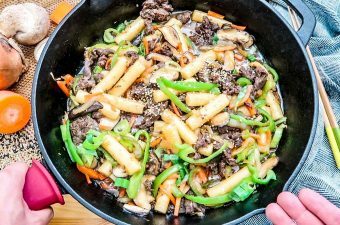 Put frying pan on medium high heat. Place shiitake mushrooms and asparagus in. Cook until mushrooms and asparagus get a nice brown charring. Then pour glaze in and coat the veggies. Turn off heat. Put rice into a large bowl. Put handful of mungbean sprouts on top. Then pour the glazed veggies over the sprouts. Add guacamole slices to one side. Garnish with scallions and sesame seeds. Enjoy!